*SUPERB FOR HOME, OFFICE, OR TRAVEL* This portable desk is ergonomically designed to set up an office anywhere! It features a power bank with 2 USB dual ports that allows you to charge the majority of mobile devices including, mobile phones, MP3s, Tablet PCs, eReaders and any other device that charges via USB port. With a built-in 10000 mAh lithium ion battery, you will never have to worry about your device's battery when you work comfortably in bed. Our portable desk can power up to 40 hours of additional talk time on your phone, or up to 8 hours of additional internet time on your tablet. This table can easily be folded small enough to fit in your backpack or suitcase. Take folded it anywhere for travel. Fold size is only 13" x 11" x 2" inches, it's super lightweight (only 4lbs) and conveniently stores in a drawer or under your bed. 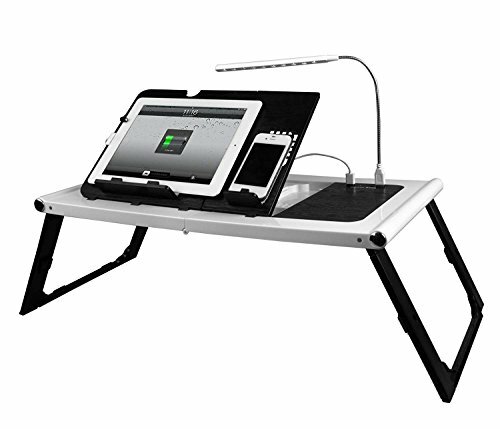 *ADJUSTABLE FEATURES* The Smart Charge Table provides exceptional functions and features that no other portable desk has: The height effortlessly adjusts from 8½ to 11" and in between. In addition you can adjust the support's tilt angle between 0° - 90° degrees to get the perfect viewing angle you desire to comfortably work on your tablet, smartphone, MacBook and much more. The standing desk comes with a 10 bulb LED light included for free to provide light when you study, work or it's excellent for illuminating your work or for night time reading. *Smart Charge Table Guarantee* We are committed your complete satisfaction. This means you get a guarantee like no other. If you are not happy with your product we will refund 100% of your purchase. STURDY: Made of ABS plastic with tungsten steel supports for long life. Comes with bright 10 bulb adjustable LED light. If you have any questions about this product by Smart Charge Table, contact us by completing and submitting the form below. If you are looking for a specif part number, please include it with your message.